With so many options for visiting Buffalo National River, finding a starting point can be tough. In springtime, the blossoming redbuds and dogwoods provide spectacular viewing. In autumn, the reds, bronze, and gold colors blaze throughout the park. For many, the main attraction is the river itself. Expert river runners might decide to hover around the Hailstone section waiting for that one rainfall event that will turn the river into serious whitewater. The casual enthusiast might just lay back and float the slow waters of midsummer in the middle and lower sections. Beyond the river, more than a hundred miles of maintained trails offer a myriad of options for touring by horse or on foot. 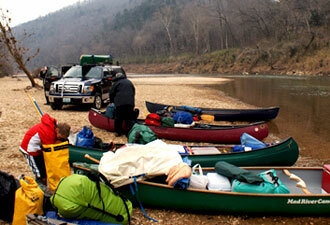 In the Ozarks of north central Arkansas, Buffalo National River is many things to many people. 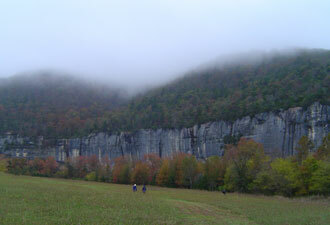 America's first national river runs 135 river miles, beginning not far from its headwaters in the Upper Buffalo Wilderness of the Ozark National Forest, winding its way through Boxley Valley where visitors gather in large numbers for fall elk and color viewing opportunities. While the Upper Buffalo District is perhaps the most challenging section for kayakers and canoeists, there are still tricky places downstream that make your visit more than a simple float. Constant vigilance and careful planning are needed to ensure a safe and enjoyable trip for you and your family. And plan carefully if you're interested in a summer trip downstream of Roberson's Hole–the entire river goes underground for about a mile nearly every year! Campgrounds dot the Buffalo River along its length, some more developed than others, all with unique resources to enjoy. Horseback trails and horse camps are available park-wide. Open hayfields perpetuate the pastoral setting of the landscape while dark forests and tall limestone and sandstone bluffs provide the avenue through which the river flows. 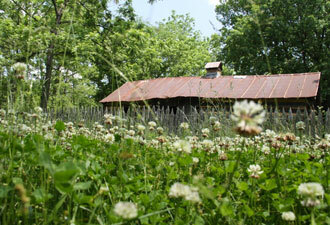 Outdoor recreation is a big lure at the Buffalo River. If fishing is your goal, try out some of the less-travelled sections of the river for smallmouth and Ozark bass. Few visitors fly fish, but give it a try for some fast action. Hunting season gets underway in the fall when most floaters are off the river for the year. White-tail deer and turkey are abundant throughout the area. If staying in a rustic cabin built by the Civilian Conservation Corps prior to World War II intrigues you, then head east to Buffalo Point, shut off your cell phone, get a fire started, and read your book on the porch. While you're there, hike to the Indian Rockhouse to see a bluff shelter that visitors have enjoyed for the past 7,000 years. History buffs can explore at least 40 cemeteries in the park, documenting the passings of generations of farm families who earned their livelihood working the sandy bottoms or hard rock uplands. You may be someone who wants to work off your visit by assisting in one of the park's river clean-ups or other volunteer projects that are vital to maintaining the beauty and integrity of the river corridor. Clearly, there are too many options for only one visit, so make that visit count. You may be persuaded like so many to come back again…and again.